Apple unveiled the anniversary edition smartphone, alongside an iPhone 8 and its bigger sibling, the iPhone 8 Plus, at a press event at the brand new Apple Park campus in Cupertino on Tuesday. The company also announced a new Apple Watch with a cellular connection, an Apple TV that streams 4K video, and gave the public its first peek at the circular Steve Jobs Theatre. It is Apple’s most expensive phone yet. A 64 gigabyte capacity model will cost £999 in the UK, when it goes on sale on 3 November. A 256GB version will be priced at $1,149 (£1,149 in the UK). The 64Gb edition will be little lightweight with all this new technology today’s 64GB capacity seems a little mediocre. 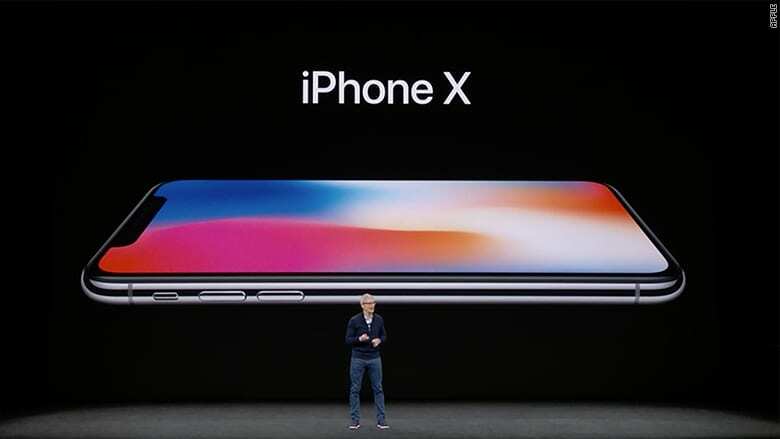 To introduce the iPhone X, Apple CEO Tim Cook uttered the classic line at the annual press conference: “One more thing.” and quoting it as the “biggest leap forward in smartphone technology” And WTX asks does it make your phone safer, well apple said face detection is more secure than fingerprints. It added there was one in a million chance of a person imitating the face ID. An improvement from one in 50,000 chance of a random person being able to open your phone with their fingerprint. The loss of the home button means no more fingerprint sensor. To unlock the phone, you can use your face with a new technology called Face ID. Front-facing cameras and sensors create a map of your face to determine if you are the phone’s proper owner. The new iPhone X kills the home button to make space for a larger screen. It has an edge-to-edge display, glass on the front and back, wireless charging that requires resting the phone on a special surface, and a surgical grade stainless steel band around the edges. It’s water and dust resistant. The 5.8-inch OLED display isn’t just bigger, it also packs 458 pixels-per-inch. Apple calls it a Super Retina Display. It supports HDR, has a million-to-one contrast ratio and improved colour accuracy. For those not willing to shell out a grand for a new smartphone, the iPhone 8 options are cheaper and also pack a powerful punch. They’re faster, sturdier and better at snapping photos than the previous iPhone. On the surface, the devices look similar to the iPhone 7. The iPhone 8 clocks in at 4.7 inches and iPhone 8 Plus is 5.5 inches. But inside is an A11 “bionic chip” and an improved camera sensor. There are new camera modes, including an expanded Portrait Mode that lets you change lighting effects after you take the shot. The company also teased some of the new features coming to iOS 11, including augmented reality. Wireless charging, available on both the iPhone X and iPhone 8 devices, is a big move forward, too. The charging requires contact between a special surface and the glass back of the iPhone. The technology is based on Qi wireless charging, which Apple believes will be available at coffee shops, stores and airports around the world in the near future, so people can get juice on the go. All this ‘new innovation’ won’t come cheap: at a starting price of £999+ it’s the most expensive iPhone to date. Apple is often accused of being slow to new tech, and that criticism will continue. Wireless charging comes years after Samsung first introduced it, for example, and the overall look of the phone – which no longer has the iconic home button – looks suspiciously similar to the latest Samsung Galaxy Note. However, Apple’s ability to get consumers to spend more on its smartphones than rivals’ was “legendary”. They have the best PR and Marketing strategies in any global tech producer and as always the anticipation is surreal. Millions watched the live event yesterday. Find out how the markets reacted to the new Apple products and how apples shares have reacted.